How do we know if charter schools really do a better job of educating students? After all, maybe it’s just that better students apply to charters in the first place. The usual way of controlling for this is to examine charter schools that select students by lottery. It’s entirely random who gets in and who doesn’t, so if the charter kids do better then it probably really is due to the school itself. Ever since seeing Waiting for Superman, I’ve had a nagging question about this. That documentary, if it’s accurate, made it clear that parents who apply to charter schools are almost desperately anxious for their kids to get in. In fact, many of them view it as practically their only chance to escape their local schools and get their kids a real education. The ones who lose the lottery are profoundly deflated. So here’s my question: is it possible that the mere act of losing out in a charter school lottery changes some parents’ behavior? With their hopes dashed, do they give up? Do they gradually stop taking an interest in their child’s education? Do they become fatalistic about the prospect of success and stop prodding their kids to do their homework, behave in class, and get to school on time? And if some substantial fraction of them do, how much overall impact does this have on the aggregate test scores of the lottery-losing children? Last night, Adam Ozimek blogged about a new NBER study that takes a crack at answering this question. All the usual caveats apply: It’s only one study. A variety of techniques were used to select only about 4,000 students out of the original sample of 16,000. The study covers only a single semester, which might not be enough time to see a substantial “loser effect.” And the specific variable that they studied is fairly limited. their old schools. The only difference was that some knew they had won the lottery and would be moving on, while others knew they had lost the lottery and would be staying at their old school. We interpret this as students exerting more effort towards academics at their current school due to an increase in intrinsic motivation from knowing that they will be able to attend a school of their choice in the subsequent school year. To our knowledge, this is the first paper to separately identify this important channel through which NCLB school choice provisions may positively affect academic achievement among low-income and minority students. I’ll repeat that all the caveats above apply. Truancy is an interesting proxy, but it hardly tells the whole story of student/parent motivation. And if there is a negative effect on motivation from losing a lottery, it might well take more than a few months for it to show up. 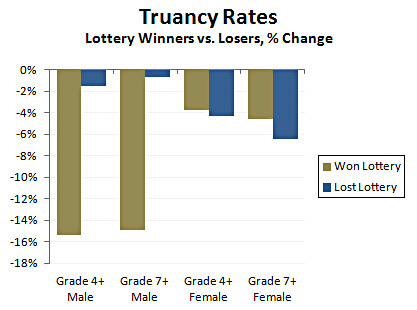 However, to the extent that this study tells us something, what it tells us is that losing a lottery doesn’t seem to make kids any worse off or any less motivated. The effect is purely a positive one for the winners.